Last week, Australian LNP and Labor Senators passed the most significant National Security Bill for nearly a decade, laughing as they did it. We didn't need to live with the worst, most restrictive aspects of this legislation. If Labor had stood with the Greens and cross benchers against these proposals, they could have been defeated easily in the Senate. The Greens will oppose the Bill in the House of Representatives. If it looks like passing, Greens' MP Adam Bandt will move amendments. Since the Senate passed the bill, plenty of critics have been sending out columns, tweets, facebook posts and press releases condemning the new powers. The serious questions are: why didn't the community hear the messages of concern from opponents of the bill earlier? Why was there so little coverage of the bill? I'm asking myself these questions as much as anyone else. But unless we can answer them, exhortations for journalists to do better or for the laws to be stopped seems a bit like closing the stable door after the horse has bolted. Spying and intelligence laws always involve a balance between the extension of state power and the restriction of freedoms of communities and individuals. This bill is the first of three bills that the government aims to push through parliament in the next few weeks. Can more be done to oppose excessively restrictive aspects of the next two bills? Those who support the bill describe it blandly as a 'modernising' reform that will make sure Australia keeps abreast with our "contemporary, evolving security environment." While there is some truth in these claims, they are designed to confuse the community by explaining away the changes. This blog post focuses on the threat posed by the bill to freedom of communication and journalists' right to report on matters involving intelligence in the public interest. There are many other aspects of the legislation which are unclear or need more discussion but unless we have media freedom to report abuses, you won't know about problems when they do occur. I'll begin by exploring the political processes that led to the passing of the Bill in the Senate. At the outset, let's be clear. This bill has been a long time in the making. Labor was involved in framing this legislation while still in power. The new LNP Attorney General George Brandis tabled a fresh bill the National Security Legislation Amendment Bill (No. 1) in July this year. The bill was referred to the Joint Committee on Intelligence and Security. Significantly, the Greens and independent MPs and cross-benchers were excluded from the Committee. At the time, The Guardian and Fairfax Media along with some other organisations issued clear alerts about the threat to media freedom posed by the bill. It was really no surprise to discover that when the Joint Committee finally came out with its report on September 17, Labor and the LNP agreed on the key features of the bill, recommending only minor amendments..
Let's put the names of real people to the anonymous sounding Joint Committee. It's chaired by Liberal Dan Tehan and includes fellow LNP members David Bushby, Philip Ruddock, Bruce Scott, David Fawcett and ex-Senior army officer and head of Defence public affairs Andrew Nikolic. Labor's Anthony Byrne is Deputy Chair of the Committee. He was rewarded with special thanks last Thursday evening by Attorney General George Brandis for his assistance in getting the bill through the Senate. He is joined by Labor's Deputy Leader Tanya Plibersek, Stephen Conroy, John Faulkner and Penny Wong. In July, Crikey's Bernard Keane predicted that with the addition of Conroy, Wong, Plibersek and Faulkner, the Labor contingent on the committee looked strong. This strength turned out to be of no benefit to critics of the bill. While the current atmosphere of fear and tension fuelled by media provide a convenient moment to strengthen ASIO's powers, the long term aspiration for the bill was to prevent leaks such as those that occurred last year when whistleblower Edward Snowden exposed the role of the Five Eyes group of nations. The Five Eyes which includes US, UK, Canada, Australia and New Zealand, has been cooperating and sharing the results of spying projects for decades. The revelations show while the projects may be in the interests of the US National Security Agency, they are not necessarily in the interests of the public in any country. As journalist Glen Greenwald told the ABC in June this year, the Snowden documents revealed that ASIO had asked the NSA to help them spy on Australian citizens. As he explained, the request was a broad one. The problem is, and if you look at the letter ... they're not asking for very specific individuals to be surveilled. They're asking for a wide surveillance net to be cast over the Australian communications system.Historically, whenever you allow government officials to engage in mass surveillance ... the abuse is virtually inevitable. This bill criminalises disclosures such as those of WikiLeaks and Snowden and seeks to intimidate and punish journalists such as Greenwald. Take for example if the bugging of East Timorese leaders during their negotiations with Australia were to happen today. If such an operation was declared a ‘special intelligence operation’ reporting of the bugging could be covered within the bill. Unless the government or intelligence agencies themselves chose to make it public, even evidence of complaints from the East Timorese government could be prohibited in Australia. As journalist Antony Loewenstein told the ABC's Will Ockenden last year, "Regardless of who’s in power in Canberra there’s a sense somehow that although the US prosecutes intelligence security around the world, Australia wants to be seen under that umbrella and rarely asks questions privately or publicly... Some in the media and many of the political elites on both major sides collude to keep the issue as unimportant or simply, business at usual." The Joint Committee held two public hearings and received 31 submissions about the Brandis bill. There were also two private classified hearings. All this information is publicly available on Australian Parliament House site. This bill smooths the way for integration with overseas agencies, provides immunity to contractors as well as agents of spy agencies, increases existing penalties for reporting ASIO operations and restricts and punishes any communication about special operations. Special operations are undercover investigations which usually involve the likelihood of agents becoming involved in crimes or planning crimes. They can easily drift from investigation of crime to entrapment or encouragement to commit crimes that otherwise might have not occurred at all. The submissions are worth reading to get a deeper understanding of the problems with the Bill. These small extracts focus on the public right to know and the restrictions on journalists' reporting. A journalist might, for example, be subject to up to five years imprisonment where they publish an article containing any – even very vague – information about an ongoing terrorism investigation that relates to an SIO. A teacher who subsequently uses this article as a discussion aid in a legal studies class might also be caught by the offence. This first disclosure offence therefore has the potential to have a considerable chilling effect upon public debate about matters that are clearly of national interest. Under the proposed SIO regime, a journalist could still be subject to up to ten years imprisonment for publishing an article which reveals the abuse of that regime, such as, for example, the general surveillance of non-suspect Muslim communities. These exceptions (for disclosures in the bill) are narrow and weighted heavily towards intelligence operatives. There is no exception providing for the public interest, the national interest or the legitimate role of the media. We are concerned that the reforms will have a prejudicial impact on journalists reporting on intelligence operations, which may lead to prosecution and imprisonment of journalists who receive disclosures about such matters and report them. This is an unprecedented clause which would capture the likes of Wikileaks, the Guardian, the New York Times, and any other media organisation that reports on such material. We note that the penalties exacted upon whistle-blowers in such circumstances would be unduly harsh. Isolating potentially serious abuses of government power from public scrutiny is dangerous and liable to abuse. As Crikey reported in August, most of Australia's media corporations joined in a joint submission. insertion of proposed section 35P could potentially see journalists jailed for undertaking and discharging their legitimate role in a modern democratic society – reporting in the public interest. Such an approach is untenable, and must not be included in the legislation. This alone is more than adequate reason to abandon the proposal as the proposed provision significantly curtails freedom of speech and reporting in the public interest. This is particularly so as the proposed section 35P prohibits any disclosure of information relating to an SIO, not just reporting in the public interest. In addition, SIOs by their very nature will be undisclosed. This uncertainty will expose journalists to an unacceptable level of risk and consequentially have a chilling effect on the reportage of all intelligence and national security material. A journalist or editor will simply have no way of knowing whether the matter they are reporting may or may not be related to an SIO.....To illustrate this further, if the producer or editor disclosed the information to anyone in the course of making an editorial decision, then the source, the journalist and the editor could all be jailed. The conversations that are currently able to be had as media outlets make responsible decisions about disclosure in the public interest, would be denied under the proposed legislation, because any disclosure by anyone – to anyone – would be a criminal offence. Perhaps reflecting its broader international experience, The Guardian mounted a powerful defence of what it considers to be journalism about intelligence matters in the public interest. immunise operatives of intelligence and security agencies from the usual consequences of breaking the criminal and civil law in certain circumstances. criminalise acts which enhance accountability and which are of proven value in a democratic society, in particular the cultivation by journalists of sources and disclosures that can augment the oversight work of Executive Government, Parliament and the Judiciary. expose to heavy jail terms persons engaged in legitimate acts of democratic scrutiny, including whistleblowers, journalists, academics and civil society organisations concerned with liberty, government accountability and the rule of law. The consequences of proposed new section 35P would do damage to one of the essential checks and balances in a democratic society. The work of journalists, co-operating sometimes with whistleblowers willing to take great risks to help expose unlawful or improper conduct in government and elsewhere, is one of democracy’s great safety valves. Its public interest value is myriad. It may force an end for the time being to corrupt or harmful practices; it may avert them; it may serve more generally to inform voters’ in their judgments at the ballot box. The existence of the potential for disclosure can itself be a potent deterrent to wrongdoing or negligence or the kind of strained self-justifications to which like-minded people in closed decision-making environments are prone. It is the importance of potential disclosure which makes the chilling effect of provisions such as proposed new section 35P so damaging. Lips may not be pursed to blow a whistle. Journalistic enquiries may not begin, may not reach far enough. The submission made the important point that experience shows that media disclosures can lead to inquiries and safeguards that protect the public. Of the 20 public reports of the Inspector-General of Intelligence (as at 31 July 2014), nine appear to have been triggered directly or indirectly by media disclosures. All these submissions were publicly available. The Conversation also published a report about the bill in late August that was reprinted in Mumbrella. There is no excuse for journalists not being able to come to grips with the Bill quickly enough. There was plenty of warning and plenty of information available. Every committee member was very well aware in recommending the bill that civil society and media organisations viewed the threat to journalism and the public right to know seriously. Every media organisation knew that journalists' rights to report on intelligence and policing matters were under further threat. How the Committee disposed of objectors' arguments? The Committee held two public days and two private hearings. Dr Lesley Lynch appearing on behalf of the NSW Council for Civil Liberties told the Committee that she regarded it as an "outrage" that the Committee was proceeding without seeing the whole planned package of laws. "if we proceed with this, you cannot—we cannot—get a sense of the cumulative impact of what it is we are putting on the books." Her argument was brushed aside. She reminded the Committee that "these short-term exceptional pieces of legislation may well be with us in the longer term. And from where we sit at a state level as well. we are beginning to see in a very significant way one of the ripple effects of that as these exceptional and previously unthought of kinds of practices rolling over into criminal law at the state level with pretty significant and pretty worrying effects." She went on,"unlike most western democracies, we have no bill of rights, we have no charter. We are, therefore, in a more vulnerable situation in terms of impact on our liberties, our rights and our democratic principles, and the nature of our justice system than most other western democracies." Federal Secretary of the MEAA Chris Warren tried to communicate to the Committee the importance of the media's historic role in revealing abuses of power by intelligence agencies. MP Andrew Nikolic drew on his defence experience in rebuffing Warren, "Over the years I have spent a lot of time interacting with the intelligence community—a highly specialised organisation that builds over time the skills, knowledge and attitudes to separate the wheat from the chaff, if you like, in the information that they encounter. What training or special knowledge gives those who publish for a living the contextual understanding to similarly separate the wheat from the chaff, to decide whether they will sit on something, to use your words, or to publish?" There was no doubt where Nikolic stood. Warren: Usually decades of experience. It is exactly the same skill and development that comes from doing the job over many years. I think it is a mistake to assume that journalists are not acutely conscious of the dangers posed by terrorism or by non-state actors." Warren: So, as I say, journalists are not foolish or cavalier about this. They are aware of the dangers but they are also aware of the very critical role that they have to play in keeping the public informed. I think the test is: look at the record. The record in Australia—I think it is also true in other countries—is that journalists have handled these matters, where they have been leaked to them, with sensitivity and respect both of security and of the public's right to know. When Warren raised the possibility that ASIO would track journalists to collect intelligence, LNP Senator Fawcett was not happy. Fawcett: So do I take it, Mr Warren, that you do not have confidence in the current system of warrants—because, to actually access that kind of information, an agency would need a warrant to do that. Warren: It is difficult to know, as to the system of warrants, because of the confidentiality around the warrants. I do not make that comment either way. But we are genuinely concerned about anything that would enable the security agents to enter into the computer infrastructure of journalists or of media information, and to do the broad range of activities to that that is laid out here. Shortly after that exchange, Warren's contribution to the discussion came to an end. This does not mean that no revelations will ever be made. But when they do, the risks for those involved will be high. The Committee process was biased in favour of secrecy and the power of ASIO to frame the debate. There were two secret private hearings when ASIO was allowed to respond to the criticisms and no opportunity given to community actors to respond further. The Bill does provide for a defence of 'recklessness' for those who are prosecuted for making disclosures public. This would cover accidental reports. As soon as a reporter had the slightest idea that information involved a "special operation", he or she could either keep the information secret or better still from ASIO's point of view, let them know about the leak. Deceptively, the Committee recommended that the Director of Public Prosecutions would only prosecute in the 'public interest'. A casual reader could conclude that this had something to do with reporting 'in the public interest'. "Public interest' is used in many different contexts. In fact all prosecutions are supposed to be in the 'public interest'. If for example, an accused's death is imminent, it would not be 'in the public interest' to prosecute. In its report, the Committee highlighted the important role of ASIO’s existing 24-hour media unit in providing opportunities for journalists to clarify any concerns about a possible operation, including about the re-publication of any information. In tune with its lack of understanding of media freedom, the Committee actually wants to foster the sort of dependency on unnamed official sources that encourages passivity and timid reporting. If there was a public interest defence, it is possible a media organisation could negotiate any security concerns with an agency but without one, no reporter with a serious intention to publish a leak would go near ASIO. It's not the job of journalists to chill out with ASIO and police. When we think about censorship, we tend to think of the absence of reports. But a secrecy regime does not mean there will be silence about security activities. There will be plenty of stories but these will be fed to a media that is reliant on a drip feed of calculated leaks and official versions that can easily turn out to be exaggerated or plain wrong. As ABC Media Watch's recent report Controlling the Message and Telling Tales of Terror have demonstrated. The 800 strong raid package that has so far led to two people being charged ( one was given a bond for possession of a stun gun) came complete with a tweet alert and police video. The more compliant most media organisations become, the more difficult it can becomes for serious reporters to do their job. Their organisations can be punished by the withdrawal of routine information so that they appear to miss the latest 'big story'. This used to be the reason why some media organisations had two police reporters, one for investigative work and one to stay on friendly terms with the police, a luxury unlikely to be affordable these days. The problem for freelancers, smaller and non-profit organisations is that they often lack sufficient resources and legal support to carry out risky investigations. The Guardian covered the submissions and hearings. Reports: Australian intelligence watchdog wants clarification on national security plan and Counter-terrorism proposals ‘greatly concerning’, say civil liberties groups. The SMH, The Australian, Crikey and Computerworld also carried reports ( Par added October 1,2014). On 4 September 2014, the Committee wrote to the Attorney-General advising that the report would be delayed until later in September. When the report was tabled on September 17, it made a number of minor recommendations, some of which provide for limited oversight of the new powers by the Inspector General of Intelligence and Security. These sort of mostly secret accountability mechanisms are better than nothing but do not address serious human rights and freedom of communication problems with the bill. Otherwise, the Joint Committee report accepted the draft bill that Brandis had presented to parliament in July. The timing of its release could not have suited the government better. There was little time for critical discussion in the media to inform the public about which of its freedoms were being traded away for the foreseeable future. But in any case, the media was busy amplifying ASIO, police and political messages about troops leaving for Middle East, heightened threats, raids and racist calls to 'ban the burka'. Democratic Liberal Senator David Leyonhjelm raised an alarm that the Bill could allow torture. This then became the story, obliterating many other problems with the bill including those relating to freedom of communication. Brandis announced that although he did not consider it necessary, he would add a rider explicitly prohibiting torture. Even the new head of ASIO Duncan Lewis said he was "perfectly happy" with this idea. Behind the scenes, they were probably relieved that thanks to journalists' tendency to chase the same story, many other concerns about civil liberties in the bill were being forgotten. Given the highly concentrated nature of the mainstream media agenda and editorial managers' allocation of reporting resources , most Australians heard little or nothing about the bill. On Wednesday, Greens Senator Penny Wright objected to the rush to pass the bills after a "faux inquiry by an exclusive committee of Labor and Liberal MPs. The community should be involved. Australia's counter-terrorism organisations already have very extensive powers. In times of heightened security, civil liberties and legal norms like the presumption of innocence are more vital than ever." The bill itself and the government's final amendments were only available just before debate on the bill began on Wednesday. A report from the Scrutiny of Bills Committee spelling out problems with the legislation and the Attorney General George Brandis's response to it was not even tabled until well after the debate had begun. The bill wasn't scrutinised by the Senate Legal and Constitutional Affairs Committee or the Human Rights Committee. In my view...many of the provisions of this bill will be found to be incompatible with various human rights in Australia. It is likely that the committee will actually make the same finding at the end of its process. But it is also likely that the government and the opposition will have dispensed with this and will pass the bill before it has even been canvassed by the human rights committee, making a mockery of the process that is designed to give appropriate consideration to human rights in the law-making of our national parliament. Once the debate started, Brandis stonewalled questions from Greens Senator Scott Ludlam and other Senators trying to probe the intent and limits of the powers in the complicated bill. Anyone watching could easily conclude that Brandis was deliberately withholding information or was not prepared to elaborate on what the bill meant. An interchange occurred between Ludlam and Brandis about the government's decision to eliminate the position of Independent Monitor of Anti-Terror legislation as part of its campaign to get rid of what it perceives as unnecessary red tape. As constitutional lawyer Professor George Williams told the SMH in March, "The decision to do so is unfathomable. Repealing the office will do nothing to liberate people from bureaucracy and red tape. In fact, it will frustrate that aim.. Since then Brandis has changed his mind but has not appointed anyone to replace Brett Walker SC who completed his term. Brandis told the Senate that the position is only needed to scrutinise legislation after it is passed. Surely it would be better from a public policy point of view to have full expert scrutiny before such significant legislation rather than afterwards? A series of questions from Ludlam led to an admission by Brandis that there will be no limit to the number of third party computers ASIO will be able to access beyond its immediate target. A Greens' amendment limiting the number to 20 was rejected by the Senate. Cleverly, Ludlam had generated a significant news story that conveyed the dangers of the laws. Australian spies will soon have the power to monitor the entire Australian internet with just one warrant, and journalists and whistleblowers will face up to 10 years' jail for disclosing classified information, reported Fairfax's Deputy Editor of Technology Ben Grubb in the SMH. You can see why the government was afraid that the more people understood about the bill, the less safe they would feel. When the Greens persisted in trying to discuss the bill, LNP Queensland Senator Ian Macdonald came to Brandis's rescue by moving the Greens amendments for them without their consent which shut down discussion and forced the process forward. Ludlam correctly described it as bullying. So far, we can conclude that a lack of media resources and time to analyse the bill, a narrow and superficial approach to news agenda and analysis and the government's determination to allow as short a time as possible for discussion all played a role letting down the very 'public right to know' about which journalists claim to care so much. On the other hand without the questions and discussion from dissenting senators, media discussion of the Bill that might otherwise have not occurred at all. The media constantly use their power to frighten, persuade, inform and entertain. Given the media organisations' strong submission, you might expect those organisations and the reporters employed by them would have provided strong and critical coverage of the bill. Instead, they paid scant attention while they pursued the sensationalist divisive agenda set by the LNP government. I'm not suggesting that events such as police raids and alleged terror threats shouldn't be covered provided that a normal journalistic scepticism is maintained which on this occasion it wasn't. The shockingly sensationalised and wrong reporting has been amply demonstrated by ABC's Media Watch this evening. But if you profess to be concerned about media freedom, why not also warn the public of the dangers and permanent damage to democracy that can be caused by rushing to strengthen security and secrecy without sufficient scrutiny and debate? Last weekend, The Guardian's Katharine Murphy wrote a column about her disappointment with the media and community's failure to campaign against the bill. Yet nobody, apart from the industry, the Greens and a couple of cross bench parliamentarians stood up for press freedom. The freedom warriors of the Coalition, and the accountability merchants of the ALP, waved the restrictions through without a backward glance. The community as a whole declined to be outraged. Murphy is right about the Greens and cross benchers standing up for press freedom. But is she really fair on the community? How could the community be outraged if most people knew little, if anything, about the bill? Perhaps by 'community' she means the civil society organisations that made submissions. One of the most effective reports published last week before the Senate passed the bill was a short summary of the legislation by The Guardian's reporter Paul Farrell. This sort of summary piece would have once been published on wire services and by all major media outlets. Unless people understand the basics, you can't expect them to care about the issue. The Guardian followed the issue throughout the week. After the bill passed the Senate, Farrell warned, Journalists and whistleblowers will go to jail under new security laws. But unfortunately The Guardian is not 'the industry'. While its audience may be growing in Australia, it's still relatively small. 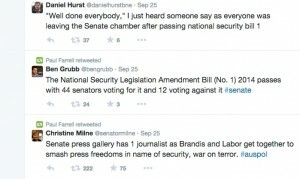 Fairfax Media's Deputy Technology Editor Ben Grubb wrote two strong news pieces, but one of them came after the Bill had passed the Senate. Grubb also did some good interviews with critics which were posted on the web. I could find no Fairfax editorial against the freedom of communication restrictions in the bill and even more surprisingly only one comment piece. Compare this to the sort of coverage on similar issues we used to get from Fairfax a decade ago. It was a little hard to understand why the SMH left its explainer until after the bill passed the Senate. Jonathan Holmes wrote an excellent column for The Age I that was focused on preventative detention orders rather than communication. I could find no mention at all of the ASIO legislation in the Sun Herald's extensive coverage of 'terrorism' threats. Overall, Fairfax's mistake in publishing the wrong photo of young man who was killed by police in Melbourne unfortunately overshadowed its reporting last week. Despite championing themselves as supporters of free speech, News corp columnists were too busy slamming into ABC's Q and A for allowing two Muslim women to voice their criticisms of media stigmatisation of Muslims and other matters to focus on the bill. The entire News Corp audience was given almost no information about the impact of the bill on media freedom until after the bill was passed. On Sunday, Laurie Oakes published a short column Our free press is under seige but this was after the event. Although News Corp dominance may be weakening, it's still a key news source in six Australian capital cities. It was disappointing that when reporters had opportunities to ask questions, they didn't seem to do so, or at least their questions didn't go to air. For example, experienced SKY reporter Janine Perritt had a great opportunity to ask Brandis some questions about the impact of the new national security on the media. She passed it up. ABC 7.30 Presenter Leigh Sales also had a chance to ask Deputy Chair of the Committee Labor's Anthony Byrne, who is a real player on the Joint committee about the threat to journalism while interviewing him about the young man shot in his electorate last week. The debate was before the Senate and it was surely on topic since the young man had been reported to be feeling threatened by police powers. Overall, the ABC's coverage seemed slight. Before the Bill passed the Senate, PM did an interview with the Chair of the Committee LNP's Dan Tehan. The failure to provide for an exemption for media reporting in the public interest wasn't even raised. On Friday morning, AM's Naomi Woodley did a strong report , but again this was after the Senate passed the bill. How did smaller independent outlets cover the Bill? Crikey often publishes strong coverage on security laws, including an earlier strong report on this bill. This is why I was surprised by Bernard Keane's report last Friday warning the public to Stay calm on terror laws the worst is yet to come. Keane correctly reported that there are already media restrictions for reporting intelligence matters (see below). But were the dangers of the laws being exaggerated? Even if there is 'worse to come' (which is hardly comforting), it doesn't mean that that these laws are not a serious threat. It was odd that Crikey promoted this column as 'debunking myths', especially as it arguments seem to depend on a very benign view of the bill. For example 'Special Operations' do need to be defined but this does not necessarily mean they are 'narrow' as Keane argued. In fact the bill specifically allows 'special operations' to be carried on over time. It was not clear on what basis Crikey believed The Guardian, Professor George Williams, barrister Greg Barns, the Pirate Party, the Media Alliance and the Greens have all got it wrong. It was not clear who was being 'hysterical', apart from perhaps the twitter jokesters who were using satire to draw public attention to the proposals. The Saturday Paper's Mike Seccombe published an excellent analysis of anti terrorism legislation including new Queensland laws on September 20, but was unfortunately under the mistaken impression that the report had not been tabled. He mentioned the torture issue but not the restrictions on media reporting. Richard Ackland provided an analysis of metadata retention in the same issue and touched on the threat from extending access to computers. The progressive online New Matilda did two strong pieces, one from Deakin University journalism academic Associate Professor Martin Hirst, Why we should be reluctant to give police and ASIO more powers and the other by Ben Eltham, Abbott's 'Anti-Terror' Laws Are The Real Danger To Australia. Eltham's piece came out the day before the debate began and noted how fast things were moving before the legislation was even available. He could not have been more explicit in his warning. Something is happening to Australia’s democracy. It’s happening right before our eyes, in federal Parliament, on national television, on the front of our daily newspapers. And we’re applauding it.With little debate, and even less contestation, civil liberties and safeguards developed over hundreds of years are being whittled away, constrained, or removed altogether. The ALP has succumbed to the scare tactics too. Cowed by the fear of being wedged on national security, the ALP under Bill Shorten is looking increasingly craven and weak. Martin Hirst also reported for Independent Australia which also published other pieces after the vote. The Conversation also published a strong piece after the bill passed the Senate. I was interviewed on Brisbane's community radio station 4ZZZ Interview. Other community radio stations and smaller specialist outlets, such as Computerworld also cover the issue. Overall, Katharine Murphy was right. The media failed themselves and the public last week. But it's also true that if you want to be informed about media freedom issues, you are far better to follow The Guardian and independent and smaller media organisations. Their audiences are growing, a process that is assisted by supportive readers but rarely by mainstream media. It's extraordinary that Senator Nick Xenophon who voted against the bill on free speech grounds felt it was necessary to write to the media organisations after the vote expressing his concerns and seeking amendments for the next two bills. You would surely have thought that they would be on the phone to him, seeking interviews. Journalists and the media play a vital role in holding governments and agencies to account.These amendments will have a chilling effect on investigative journalism and free speech. Xenophon pointed to the example of Witness K, the whistleblower, the former ASIS officer who faces prosecution after releasing information regarding the bugging of the East Timorese Cabinet Room by Australian intelligence agencies. People like Witness K, who release information that is in the public interest, and the journalists who report on it, deserve protection. Instead, these laws are going in the opposite direction.We have a right to know if our intelligence agencies are misusing their powers or acting inappropriately, and journalists play a vital role in publicising that information. Has chilling effect already set in? Those who downplay the dangers of the new bill point to restrictions that have long been imposed on Australia media's reporting of intelligence matters. By 2010, 30 counter terrorism acts had been passed by Australian Parliament since Sept 2001. A summary of the way these restrict the activities of journalists can be found in Mark Pearson's The Journalist's Guide to Media Law. In evaluating the media's performance last week, we need to consider whether the 'chilling effect' of reporting restrictions is already so entrenched that journalists and sources accept that almost total prohibition is appropriate. You have never been able to identify an ASIO agent , current or past. Thanks to a successful amendment to the Bill from the Palmer United Party, the penalty for naming an ASIO agent will now be raised from one year to ten years. The ASIO Act also allows for journalists to be taken into custody and questioned about any information the agency suspects is relevant to their investigations. If this occurs a journalist is also prohibited from publishing anything about the incident. There was a considerable amount of opposition to these laws in 2005. Could it be that since they were passed the sort of cosy relationship ASIO desires with the media is already working well in most large media organisations? After all, the police and ASIO seemed to be confident that they could quickly gain the cooperation of the media on short notice for the recent raids on homes in Sydney. We will never know how often these 2005 laws have been used? The potential chilling effect on the media and sources is obvious. Could it be that already existing laws along with corrosive corporate editorial cultures are creating a community of journalists who are not motivated to assert their watchdog role? Be sceptical of references to 'unnamed intelligence sources' or news breaking stories that seem to following the agendas of policing and intelligence agencies and divisive politicians. So where does this analysis leave us. On Friday morning after the laws had passed the Senate, the bill got a trashing on twitter with the HeyASIO hashtag. There was no shortage of opposition, once people heard about it. I enjoy the jokes like everyone but unfortunately the laws will be with us long after the laughter dies down. As I have argued before, Australia's media is a major political problem for our democracy. I agree with Katharine Murphy's analysis of the weakness of the coverage of the new laws and that the challenge overall is to tell a more complex truthful story. But exhorting journalists to do better is at best only part of the answer. As several climate change reporters learned from bitter experience at The Australian, it's hard to buck the TeamNewsCorp culture without ending up outside the organisation. I also believe and know from my experience as a teacher of journalism that many reporters are, as Murphy also claims "capable of telling this story. It’s a story which demands the best Australian journalism can provide." Murphy seems to think that a resolve by journalists to do better is what is required while I am not sure how far such calls for renewed determination can take us. The problem is a structural one , not an individual moral one. We need to recognise that the fact that major media organisations send in a collective submission does not mean they can be relied upon to actively protect their watchdog role. They may be just going through the motions. In practice, on this occasion, they have not even bothered to pay their own audiences enough respect to tell them what is going happening. In different ways, large media organisations are in fact part of the problem. In the case of News Corp, they will not support media freedom if it stands in the way of larger political goals. Their senior editors see accountability as a form of censorship. Fairfax is operating under tough commercial and resourcing constraints and a conservative corporate agenda. The ABC and SBS are under constant resource and political pressure. In the long term, we need to deliberately and publicly nurture and support fresh voices and outlets that are not silenced. After Labor's botched efforts, prospects for media reform are negligible so our media strategies for change must be, little by little, to extend access and interest in smaller media organisations to a broader audience. Newer forms of media like twitter play a role there. But a long term strategy is no answer to the immediate threat. We need a political strategy that mobilises critical voices in both journalism and civil society more quickly and effectively than last week. One could understand Scott Ludlam's frustration when a tweet noted how outspoken commentators on ABC's Insiders were against the laws. Could journalists have complained more before bill passed the Senate? I recognise that the hour is late so I will not seek to detain the chamber for long... I simply do not believe in and cannot in good conscience vote, particularly in the climate that we are in, for continued relentless expansions of powers for these agencies ... this is politics hundreds of years old. What I mean by that is a quote that resonates for me, from Ben Franklin, who said, 'Those who surrender freedom for security will not have nor do they deserve either one.' I think that is the process that we are engaged in tonight. This bill is the first in a series expanding the powers of our covert intelligence agencies. There are at least two more bills. Keane could be right. They may be worse. Computer surveillance and retention of metadata threaten years of working for shield laws protection for confidential sources, a bedrock for investigative journalism. Imagine the inhibiting effect of the thought that ASIO is tracking every call you make or email you send. It's best to cover the news while it's happening not afterwards, although I admit that's exactly what I've done here. It's time to keep our eye on the ball. Let's not leave the complaining until later. Update: After I published this post, I read an editorial in yesterday's The Australian which criticised Katharine Murphy's piece in the The Guardian and Oakes' column. It also stated that "We do not believe that our investigative reporters, including those who regularly write on defence and security matters, will have their work significantly affected by these new laws." The Australian believes that the there is a genuine threat of terror attacks and the laws are necessarily to effectively deal with that threat. Interestingly, one of The Australians own investigative reporters was interviewed by the ABC this morning and said there was a need for a journalistic exemption. Declaration of Interest: I am a contributing editor to New Matilda.